From Vineyards Direct has been a minor sponsor of wine-pages for several years, but I am always genuinely impressed when I taste through their portfolio of wines, imported directly by them and offered for sale via FromVineyardsDirect.com, thus ‘cutting out the middle man’. 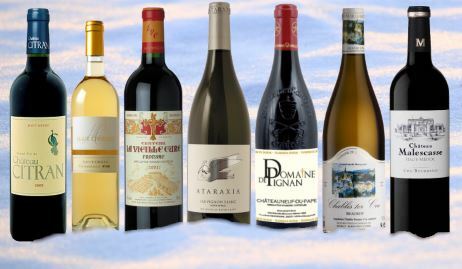 STOP PRESS: Use code TC102015 at FromVineyardsDirect.com to save 10% on ALL orders including the wines below, valid until 31st December. Tom Cannavan makes no commissions on sales. (2015) From Entre-Deux-Mers, this is a blend of 70% Sauvignon Blanc with Semillon and Muscadelle, weighing in with just 12.5% alcohol. The Sauvignon dominates the aromatics, green-tinged but ripe notes of melon and waxy limes, a nice sense of restraint and elegance and quite tight. On the palate it is really very cool and pure, much more about crunchy apple and citrus, flecked with a touch of more exotic melon and peach, but taut with a spine of crisp, shellfish-friendly acidity. A fine, delicate but vivid wine. (2015) From the higher altitude vineyards of one of South Africa's most refined uncompromising estates, this has just fabulous punch and vigour. There's passion fruit and lime and lemon peel, and a really vivacious quality, a touch of soft leafy herbs. Fabulous palate clarity too, finishing with that lemon and grapefruit juice punch. (2015) I'm a huge fan of the wines of Chablis, where more generic supermarket examples are invariably 'good', but where the best producers and vineyards can make stunning wines. This Premier Cru saw a touch of oak, which comes through with a soft sheen of butter and almond, even a touch of toast, over ripe orchard fruits. It perhaps just masks the flintiness that is there, tucked beneath. On the palate the verve of the wine is delicious, bursting through with quite vivacious fruit, and a squirt of grapefruit-fresh acidity. It is crystal clear in the finish and a truly lovely Chardonnay, but that slight lack of real terroir conviction knocks it back a point or so. (2015) Tempranillo, with 20% Graciano, don't confuse this with the 'regular' Crianza also in sale from FvD at a couple of pounds less, and where it's Grenache in the blend rather than Graciano. Creamy, vanilla and cocoa dusting to the seam of ripe black fruits on the nose, this has a cedar and pepper lift too of fine quality French oak. There's a balsamic sweetness to the fruit on the mid-palate, lovely rounded and quite meaty fruit, but long and distinguished. A very fine. modern Rioja. (2015) A first tasting of this estate for me, the wine from another of the 21st century's outstanding vintages so far and a blend of Cabernet Sauvignon and Merlot. There's a beef-stock and game perfume to this, quite animal and appealing, though it is pristine (no off aromas) and that alluring character melts into plummy and tobacco-tinged fruit. In the mouth it is harmonious and complete, the ripe fruit supported by spicy oak, a solid tannin structure and elegant cherry acids, medium-bodied and really quite long. They have certainly captured the class of the vintage. Really very satisfying at this price. (2015) Grenache, Mourvèdre, Syrah and Carignan in this organic wine from one of the Rhône Villages, and one of its top estates. Very light on its feet at first sniff, with a real Rhône lift of cracked pepper and violet, a graphite and cedar quality and good berry fruit. Really juicy on the palate, with a wonderfully mouth-filling plumpness to the fruit, a bit of chocolaty depth and rounded, plush tannins and moderate acidity. Yet it is without a doubt structured for a few years of cellaring, but the fruit and spice of the finish is delicious now. (2015) A blend of 70% Merlot, 20% Cabernet Sauvignon and 10% Cabernet Franc, this comes from a family estate stretching back five generations and is also from the superb 2009 vintage. This teeters on the brink of over ripeness aromatically, almost reminiscent of a Coonawarra Cabernet with its eucalypt mint and bloodiness, but the sweet cassis powers through. On the palate it is spicy and plummy, perhaps just a touch more drying than when I last tasted it a year ago, but the finish comes together really nicely, powerful, concentrated and substantial for a steak or roast beef. (2015) An estate whose wines I have always rated highly, though this is a first tasting of their 2003, a very good and very hot and ripe vintage in Bordeaux. Despite that, alcohol is modest at only 13% and this has game and dried blood characters mingling with the sweet black fruit and all sorts of spicy nuances. It certainly has that gamy character that some will like more than others, but for me it is archetypal mature Bordeaux, and so elegantly harmonious on the palate, the savoury and medium-bodied, very gastronomic build of the wine with enough fruit and a freshness to the finish. (2015) We're over on the Right Bank now, just west of St Emilion, for this Merlot-dominated blend from vineyards that are more than 25 years old. It's another estate that I have followed over the years and the aromas of this saturated, youthful 2004 leap out of the glass: kirsch and graphite, a keenness to this, with some game and floral perfumes adding to the complexity. In the mouth so alert and juicy: some may prefer the solid plummy character of a wine like the Taillan, but for me this has all the elegance, fruit, balance and power that sometimes only Bordeaux can deliver in such an arresting package. (2015) Co-founder of FVD, Esme Johnstone, owned Château de Sours for many years so no doubt it's his connection that let the company source remarkable 'de-classified' wines from top classed growth properties in Bordeaux. In this case it doesn't take a mastermind to work out that Ducru-Beaucaillou made the wine, and it is from a top vintage (Ducru is selling at £290 per bottle at time of writing). It is much the same and just as good as when I last tasted it several months ago: plush with cassis and ripe black plum, plenty of perfume and cedar. The framework of tannin and acidity really does show breeding, and the depth of fruit is both elegant and creamily ripe. And it has a few more years cellaring potential. (2015) Last year I reviewed the 2009 vintage of this wine and absolutely loved it. It was a mature, soft and utterly seductive wine that I rated highly, but which sadly sold-out before many wine-pages' visitors had a chance to buy. Well, this 2012 is very different in that it is much more youthful, but I have to say it is another absolute beauty. A blend of 64% Grenache with Mourvèdre, Syrah and Cinsault, as well as tiny percentages of four other varieties. Its colour is a solid crimson and it has a lovely nose of crushed red berries, a delightful floral top note, and background hints of cinnamon spice and vanilla. In the mouth it is full, rich and smooth, a fabulous fruit sweetness and fat texture, but real clarity with the refined, chocolaty tannins and pert cherry acidity. Just beautifully done. (2015) Terrific to have a fine red Bordeaux from a brilliant vintage that is beginning to drink beautifully. This 50/50 blend of Cabernet Sauvignon and Merlot has a deep, saturated colour and the intrinsic fruit and balance of this great vintage is immediately captured: a touch of cedar and of gamy depth, but swirling smoke and black fruit too. On the palate it has a really fine, mouth-coating texture with icing sugar-soft tannins and a silkiness from its ripe acidity. Plush, with plum and blackcurrant, it really is hugely classy and a real treat to find a 2005 of this quality at an affordable price.